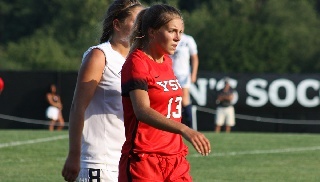 Youngstown, Ohio -- Junior Ernestina Abambila scored a goal and assisted on sophomore Alison Green's first goal of the year but the Youngstown State women's soccer team dropped a tough 3-2 decision to Xavier on Sunday afternoon at Farmers National Bank Field. With the loss, the Penguins fall to 2-4-1 overall while the Musketeers improve to 5-2-1 on the year. Ambambila has scored or assisted on each of Youngstown State's last eight goals. With the match tied at 2-2 late in the second half, a miscommunication between YSU goalkeeper Katie Montgomery and a defender led to a loose ball bouncing over Montgomery's head and into the goal with just 16:54 left in the match. The goal was credited to Xavier's Kenadie Carlson, who was the last Musketeer to touch the ball. For more than 30 minutes, the Penguins and Musketeers played a scoreless but Xavier's Tori Doss broke the stalemate with her first goal of the season at the 32:34 mark. Samantha Dewey slid a pass through the YSU defense and Doss beat goalkeeper Katie Montgomery with a shot to the left corner of the goal. The Penguins answered in similar fashion almost seven minutes later. Abambila fed a streaking Green down the center of the field and tallied her first goal of the year in the right corner to tie the game at 1-1 at the 39:32 mark. The Musketeers regained the lead when Carlson lifted a cross into the box and Dewey's header found the top left corner at the 60:05 mark. Less than two minutes later, Xavier committed a foul just outside the 18 and Abambila direct kick was lifted over the Musketeers' line of defense and into the top left corner to tie the game at 2-2. The Penguins host Oakland, Friday, Sept. 16, at 7 p.m. in the Penguins Horizon League opener at Farmers National Bank Field.